After the Union won the battle of Antietam in 1862, Lincoln issued a presidential decree to the Confederate states, declaring that he would free all slaves in Southern states if they did not surrender and rejoin the Union. The Confederacy rebuffed his ultimatum, and on January 1, 1863, Lincoln issued the Emancipation Proclamation. 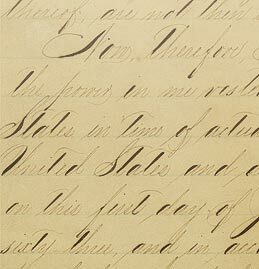 Some believe that the Emancipation Proclamation abolished slavery, while others claim that Lincoln’s presidential decree was impotent, freeing no one. Both viewpoints are flawed. The Emancipation Proclamation decreed the end of slavery in all states that had seceded from the Union. When they heard about the order, slaves from rebellion states started a mass exodus to Union soldier lines. However, the Proclamation did not end slavery in slave states that had remained loyal to the Union, or in territories of the Confederacy that had been reconquered. The Emancipation Proclamation also permitted blacks to fight as Union soldiers against the rebellion states. Ironically, Lincoln had previously refused to let blacks serve in the army, even though they had a vested interest in a Union victory, and even though the Confederacy had commonly used forced black labor to assist Rebel troops. Lincoln had kept blacks out of the army in an effort to pacify loyal white Southerners and Northerners who wanted to uphold America’s racial caste system. Although the Emancipation Proclamation depended on a Northern victory for its enactment, and some slaves were not informed of their freedom until months later, it nonetheless pierced the heart of the South. It changed the war’s focus from preserving the Union to ending slavery, and opened a path for the actual abolition of slavery in the United States.